Home » Technical Libirary » Industry knowledge » Spiral steel pipe pile and the difference between the straight-seam spiral pipe? Spiral steel pipe pile and the difference between the straight-seam spiral pipe? From the welding process, spiral steel pipe pile and spiral pipe joints directly connected, straight seam steel pipe, so you will have a lot of unavoidable T-welding, welding defects, the probability of existence is also greatly improved, and T-type weld And residual welding Increased the possibility of large stress welding metal cracks, often three-dimensional stress state. Spiral pipe and pipe, spiral pipe and straight pipe countries in the production and construction of the more widely described in detail for straight pipe joints, due to different manufacturing processes and spiral pipe, so straight seam difference is very large, there is a welded steel Pipe. Straight seam steel pipe manufacturing process is relatively simple, the main production process for the straight seam steel pipe, straight seam pipe efficient, low-cost, rapid development of submerged arc welding, high-frequency welding is straight seam steel pipe. If the T-type welding technology large diameter straight seam steel pipe manufacturing and straight pipe fittings of the short part of the dock, along the length of the required length of the connection, T-type seam straight seam steel pipe defects to improve the possibility Of significantly, T-type welding residual stress is also Large joints, weld metal, increasing the likelihood of cracking, often a three-dimensional stress state. Strength Spiral steel pipe is generally higher than the straight seam steel pipe, the main production process, can also be used to produce submerged arc spiral pipe narrow diameter large diameter pipe, pipe diameter in the production of different diameter can be the same width. , Compared to straight seam pipe, the length is the same, the weld length is 30 ~ 100%, and the productivity is low. As a result, more small-diameter tubes are almost straight-seam welded, which is the bulk of welded Large-diameter spiral steel pipe pile. In addition, the process in accordance with the provisions of submerged arc welding, each welding must have an arc extinction and location of each circular weld line fit, can not meet the conditions, which have the opportunity to appear many weld defects than extinction. When The pressure in the pipe must withstand the usual radial stress and axial stress, δδ that is produced in the wall of the two main stress. The general of DN350, large diameter spiral pipe, straight pipe why not? Wait for buyers and resellers, and so on. The problem of some of them is the difference? These issues is now outlined in this knowledge, and we have some help. May be summarized, but not comprehensive, and we hope that the majority of the people have a better proposal. 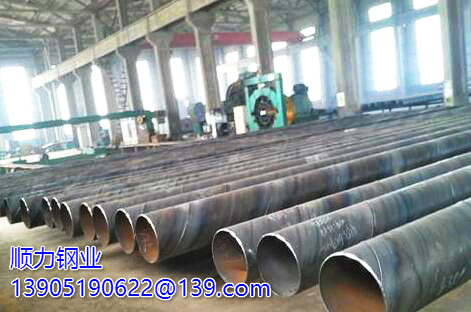 Specifically, the spiral pipe and straight pipe fittings, are welding form. The general scope of the two is not the same. DN350, you have a common, not large diameter spiral steel pipe pile, why not straight pipe? We now explain why. Since the spiral steel pipe is helically welded, in order to increase the strength of the pipe, the pressure of the liquid will be distributed on both sides of the pipe. Straight seam steel pipe, then the general large-scale spiral steel pipe pile is welded steel plate, if directly play a role in increasing the difficulty of large-scale production, but also large steel plate, it will use the larger diameter coil. Because they are not in the same range, is to good, because it is said to do better is not possible, it should be said to have their own advantages.